Thanks to Eagle Scout Jacob Heidig, Tuckahoe Park now has beautiful blue, red, and yellow flowers to admire. These plants (listed below) provide the best natural source of food and nectar for beautiful butterflies, goldfinch, and hummingbirds. 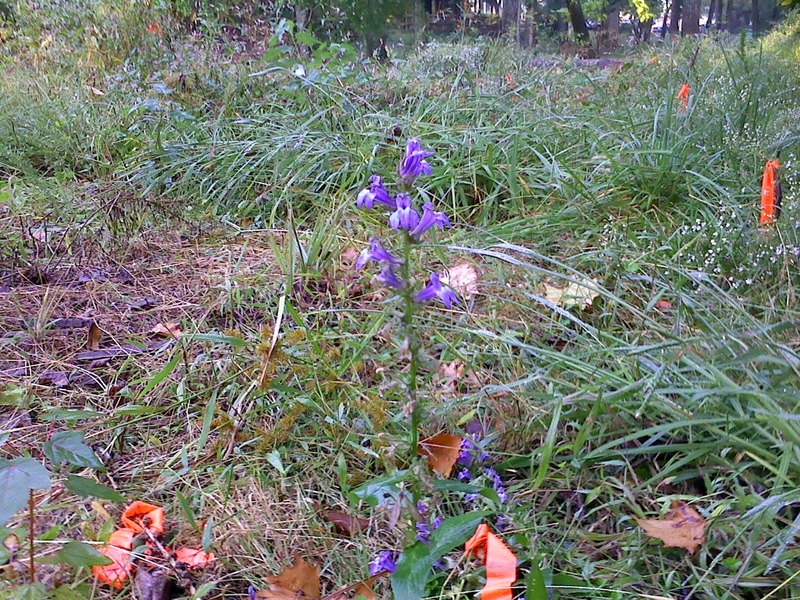 Blue lobelia planted at Tuckahoe Park by Jacob Heidig for his Eagle Scout Service Project. In June, guided by a plan he developed, Jacob led a team of high school Boy Scouts, two younger brothers, and the Eagle Scout’s dad. After pulling out weeds, they planted the flowers in the “No Mow” zone of Tuckahoe Park. You can recognize the area by the logs surrounding it. Kevin Stallica, the Parks Manager for Tuckahoe, approved the plan and chose just the right kinds of plants to provide beautification to the park. Arlington Parks donated over 60 plants. Earth Sangha grew these native plants that originated a similar spot in northern Virginia. The Master Naturalist volunteer for Tuckahoe, Mary McLean, coordinates community volunteers who want to help these beautiful flowers. Volunteer neighbors worked this September 13 from 9:00-1:00 to remove weeds choking the flowers. Now the flowers are easier to see and enjoy. 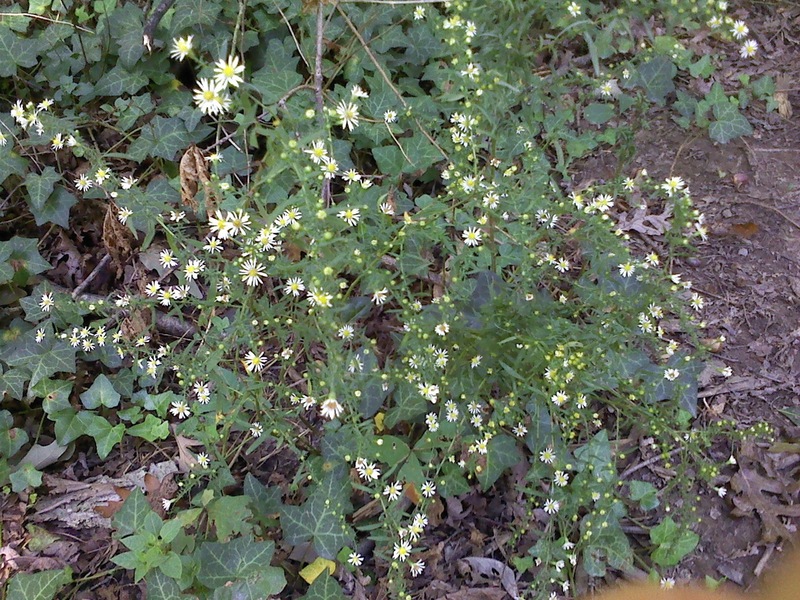 The weeds have no natural checks to keep them from taking over the space. Nothing that grew here before these weeds came to Virginia can outcompete them. Local insects and plant diseases do not put a dent in the weeds take-over of the space. That is why Naturalists at Long Branch and Gulf Branch call these weeds “invasive plants”. Invasive plants take over and can kill the plants that provide the best food, shelter, and space for the animals of Tuckahoe. Invasive plants can choke and overwhelm a flower or even a full-grown tree by cutting off water, food and sunshine. Plants that evolved together each have their own niche, providing a balanced, healthy variety of plants for a balanced, healthy variety of animals. English Ivy and stilt grass carpet much of our park in a monochrome. There are no signs of anything eating them. A healthy Tuckahoe Park forest contains a variety of large and small trees, shrubs, small plants, vines and flowers. A healthy Tuckahoe Park meadow contains a variety of grasses, beautiful flowers, butterflies and birds for all to enjoy. This entry was posted in News and tagged community outreach, education, invasives, native plants, stewardship by armneditor. Bookmark the permalink.